Author’s note: This essay was originally published in The Objective Standard. American education is a catastrophe. The evidence supporting this conclusion is overwhelming and has been for decades. For example, a December 2016 article in The Atlantic reported that fifteen-year-old students in the United States placed “near the bottom of 35 industrialized nations” on the math portion of the 2015 Programme for International Student Assessment (PISA) test. This was slightly worse than America’s showing on the 2012 PISA exam, on which American students scored below the PISA math mean and ranked twenty-sixth out of the thirty-four nations tracked by the Organisation for Economic Co-operation and Development (OECD). On the 2012 test, 55 percent of students in Shanghai, China, scored at the highest or second-highest level, as did 13 percent of all students. However, only 9 percent of American students scored within these levels. And the top students in the United States performed poorly compared to those in other countries. Students in Massachusetts, a relatively high-achieving state, scored above the U.S. national average—but ranked two years behind Shanghai students. Even more appalling, various sources indicate that some 44 million American adults cannot read well enough to read a simple story to a child—and nearly half of adults in the United States are functionally illiterate, unable even to read a drug label. Why have we allowed this to happen to ourselves? Rather, why have we done this to ourselves? How and why is it that America, historically the most plentiful source of innovative and inventive minds, has established an educational system that cripples the mind? What caused this degradation? Toward answering such questions, it is important to understand that American schools have not always been so bad. Indeed, at one time American education was superb. In the Mid-Atlantic colonies during the pre-Revolutionary period, professional educators established numerous schools to satisfy widespread demand for education. Philadelphia, for instance, boasted schools for virtually every subject and interest. Between 1740 and 1776, 125 private schoolmasters advertised their services in Philadelphia newspapers—this in a city whose population was miniscule relative to today. Professional educators provided mentoring services for English, contemporary foreign languages, science, and a wide variety of other topics. Children who grew to be such brilliant scientists, writers, and statesmen as Benjamin Franklin, Thomas Jefferson, and George Washington were educated at home or in private schools. Literacy levels of Revolutionary America were remarkably high. In 1731, Franklin helped start America’s first subscription library, and similar libraries spread throughout the colonies during his life. He later reflected, “These libraries have improved the general conversation of the Americans, [and] made the common tradesmen and farmers as intelligent as most gentlemen from other countries.” Thomas Paine’s pamphlet Common Sense, written in plain style but enunciating sophisticated political principles, sold 120,000 copies during the colonial period to a (free) population of 2.4 million (akin to selling ten million copies today). The Federalist essays, written by Alexander Hamilton, James Madison, and John Jay in support of a constitution for the nascent republic, were published in newspapers—written for and read by the common man. Given the high quality of education in early America, it is no surprise that two renowned Frenchmen who visited the United States reported on the phenomenon. In an 1800 book commissioned by Vice President Thomas Jefferson and titled National Education in the United States of America, Pierre Dupont de Nemours reported that Americans received an education far superior to that of other peoples. “Most young Americans,” he wrote, “can read, write, and cipher [i.e., do basic arithmetic]. Not more than four in a thousand are unable to write legibly.” Several decades later, Alexis de Tocqueville wrote in Democracy in America that Americans were the most educated people in history. Nor were they vague regarding what this meant. For example, famed social worker Jane Addams (1860–1935) was an early Progressive educational reformer who grumbled, “We are impatient with the schools which lay all stress on reading and writing, suspecting them to rest upon the assumption that all knowledge and interest must be brought to the children through the medium of books.” She wanted the schools to engage students in group activities and prepare them to work in the factories. Lawrence Cremin, a leading scholar of Progressive education, wrote of Addams’s theory, “Industry . . . would have to be seized upon and conquered by the educators.” The writer Charles Sykes adds, “In particular, she [Addams] thought modern man needed to be trained and educated in collective, group activities, which she invoked as the ‘spirit of teamwork.’” This emphasis on group work was a theme that would be sounded over and again by Progressives and their intellectual descendants. Progressive educators claimed that their theories and methods were based on science. In particular, they employed and emphasized the importance of IQ testing. To Progressive educators, the IQ tests provided the cutting edge of a scientific approach to proper schooling and gave the imprimatur of science to those reformers who sought to push millions of students away from academic education and into vocational training. Related to this, shortly after World War I, several Progressives created the field known as “Curriculum Studies.” John Franklin Bobbitt at the University of Chicago (and others elsewhere) held that curriculum design was a complex field that could be mastered only by experts who were fluent in the new scientific approach to education. Prior to World War I, a school’s curriculum had been designed by community school boards and educators who knew the local parents and their expectations. At the time, almost all towns and neighborhoods desired their children to learn “reading, writing, arithmetic, history, geography, and nature studies in the common [elementary] schools, and they wanted the high schools to teach Latin, a modern foreign language or two, mathematics, literature, grammar, the sciences, ancient history, English history, American history, drawing, [and] music.” This was what parents generally demanded, and this was what the schools provided. The invention of the scientific curriculum expert represented an extraordinary shift in power away from teachers, parents, and local communities to professional experts. . . . In modern school districts, control over curriculum was transferred from educators who had majored in English, history, or mathematics to trained curriculum specialists. Bobbitt’s 1918 book, Curriculum, was for years the standard textbook on the subject in the teachers’ colleges. His fellow curriculum designer, W. W. Charters at the Carnegie Institute of Technology, shared this view. He disdained the study in schools of “the works of the masters.” Such “brilliant products of genius” were of little value to most Americans, he thought. Instead, curriculum designers should discover what was “most useful to the young in coping with the humble problems of their lives.” The schools should identify a student’s likely future profession and train him for it. For example, if a student would most likely become a department store clerk specializing in credit applications, the schools should train him in the requisite skills, including “friendliness,” “ability to question tactfully,” “spirit of follow-up,” “keen judgment in answering credit questions,” and so forth. The topics taught in the American schools should be calculated neither to bestow upon a student knowledge of academic subjects nor to nurture his intellect, but, rather, to prepare him for the “humble” problems and activities of everyday life as a cog in his community. A second was “Command of Fundamental Processes,” which involved teaching basic cognitive skills. In regard to this objective, Professor Richard Mitchell, the famed “Underground Grammarian,” comments, “About the other ‘main objectives,’ they have a lot to say. . . . When they have called for Command of Fundamental Processes, that’s it. They proceed at once to Worthy Home-membership, a main objective much more to their liking.” Because Command of Fundamental Processes was the only objective to refer specifically to academic education, the Progressive educators deemed it insufficiently important to warrant further elaboration. The third objective, as Mitchell notes above, was “Worthy Home-membership,” which would ensure that every high school girl would be taught the rules of proper family management. The fourth was “Vocation,” later known as “Industrial Arts” or shop class, which would teach blue-collar employment skills. who wrote the Cardinal Principles were especially uninterested in the U.S. Constitution and the ideas of the Founding Fathers. Civics [in their view] should concern itself less with constitutional questions and [more] with . . . the informal activities of daily life that . . . seek the common good. Such agencies as child welfare organizations . . . afford specific opportunities for the expression of civic qualities. The sixth objective was “Worthy Use of Leisure,” which assumed that most people, devoid of “proper” schooling, did not know how to enjoy themselves or relax—and that training in leisure activities was a productive use of school time. The seventh and final objective was “Ethical Character,” which raised this terrifying question: Which moral code would government-run schools inculcate in young students? Might the Commission’s emphasis on “collective responsibility” and “collective thinking” provide a clue? It is jaw-dropping that in 1918, after Americans had made superlative intellectual advances in literature (Hawthorne, Edgar Allen Poe, Herman Melville, and others), psychology (William James), applied science and technology (Thomas Edison, Alexander Graham Bell, Henry Ford, the Wright brothers), and numerous other fields, that the leading organization of American educators virtually stripped academic training from the core of the nation’s schooling. Sykes notes, “The Cardinal Principles, which are voluble to the point of tedium on every aspect of schooling, dismissed scholarship with a single sentence: ‘Provisions should be made also for those having distinctly academic interests.’ And that’s it; the commission offered no further comment, suggestions, or guidelines.” The academic aspect of education was thereby treated as “an afterthought.” This philosophy quickly became deeply entrenched—indeed dominant—in the schools of education and teachers’ colleges. As studies in language and in the natural sciences are best adapted to cultivate the habits of observation; as mathematics are the traditional training of the reasoning faculties . . . so history and its allied branches are better adapted than any other studies to promote the invaluable mental power which we call judgment. But study of history in American schools was about to be eviscerated. Before the CRSE, most high schools offered (even required) a four-year development in history that covered ancient, European, English, and American history. But now, the CRSE created a new field called “Social Studies.” History, according to the new curriculum designers, had little if any social purpose. Social Studies would. The old chronicler who recorded the deeds of kings and warriors and neglected the labors of the common man is dead. The great palaces and cathedrals and pyramids are often but the empty shells of a parasitic growth on the working group. The elaborate descriptions of these old tombs are but sounding brass and tinkling cymbals compared to the record of the joys and sorrows, the hopes and disappointments of the masses, who are infinitely more important than any arrangement of wood and stone and iron. Dewey was particularly effective in advancing Progressive education because he, in effect, mixed the poison with valid principles of education. For instance, Dewey held that children learn best by experience, by choosing and engaging in hands-on projects—a principle embraced also by Maria Montessori (whom we’ll discuss shortly). He helped popularize the idea that young students should engage in real-life activities that help them to gain practical skills—just as Maria Montessori did. He held that children will learn reading while poring over cookbooks, writing by jotting down a favored recipe, arithmetic by counting eggs and weighing flour, and so forth. There is some truth in all of this. [T]hey continually experimented with different ways of [teaching] young students about primitive life in the Bronze Age . . . early Greek civilization . . . Prince Henry of Portugal, Columbus, and other explorers . . . Shakespeare’s plays; science; mathematics; algebra and geometry; English, French, and even Latin. Thus, Dewey’s educational influence was catastrophic. In addition to setting the goal of Progressive education as socializing the child, saturating him with the spirit of service, and priming him for community life, Dewey lent credibility to a host of virulent opponents of academic training, one of whom was William Heard Kilpatrick (1871–1965). Kilpatrick was the prime mover behind “the project method” of learning. An avid opponent of academic education, Kilpatrick chaired the Committee on the Problem of Mathematics of the CRSE, where he argued, among other things, that math instruction should be severely curtailed and students should be grouped into segments, so that only future scientists, engineers, and the like would engage in any substantial mathematics. He held that the rest—the overwhelming majority of American students—should be taught little more than basic arithmetic in high school. As with aspects of Dewey’s ideas, Kilpatrick’s project method incorporated a number of truths about how children learn—some quite similar to the principles of Maria Montessori. For instance, he held that very young children can advance rapidly when allowed to choose and pursue their own hands-on projects. The kinds of projects he advocated were “a girl making a dress; a boy producing a school newspaper; a class presenting a play; a group of boys organizing a baseball team.” Kilpatrick held that this project method made education like “life itself,” not merely training for adult life. Much of that is reasonable. But, like his mentor Dewey, Kilpatrick had anything but reasonable aims. His project method was not about activities that train the individual’s mind, advance his knowledge, and promote independent thinking. That is the essence of the Montessori Method, which we’ll consider below—along with Kilpatrick’s criticism of it. Kilpatrick was interested not in encouraging independence but in engineering social conformity. George Counts, another leading Progressive educator at Columbia, was even more fulsome in praise of Communism. Twice he visited the Soviet Union, becoming convinced that American schools must take the lead in transforming the United States from a capitalist into a socialist nation. Counts sought to transform Progressive education into political activism in support of socialism. Progressive educators had long held a hodgepodge of educational theories. On the one hand, they believed that the child’s impulses should guide his education. On the other, they believed that the purpose of education was to socialize him—to teach him to conform and fit into the social order. These two components were not as contradictory as they seemed. For whether children were encouraged to act on their whims, or taught to conform to the group—or, under differing circumstances, to do both—they were never taught to think independently. Under the communism admired by the Progressives, what is the political fate of those who know next to nothing and who cannot think? The conformists will obey the state. The whim worshippers, unable to formulate principles—including political ones—will give up in despair or will be crushed by the state. Or they will learn to obey, now following the caprice of the dictator rather than their own. Counts was explicit about the political goals of the Progressive education movement. In his book Dare the Schools Build a New Social Order?, as Ravitch notes, Counts “forthrightly called for elimination of capitalism, property rights, private profits, and competition, and establishment of collective ownership of natural resources, capital, and the means of production and distribution.” To indoctrinate children, he called for a consistent socialization of the classroom. He accused the “child-centered” Progressives of having no social theory “unless it be that of anarchy and extreme individualism,” repudiated the notion that education can “build its program out of the interest of the children,” claimed that America must become “less frightened than it is today at the bogeys of imposition and indoctrination,” and openly acknowledged that his socialist vision required indoctrination. Academic subjects in education and capitalism in economics are inextricably linked. One teaches cognitive independence, the other protects political independence. If one wishes to destroy political independence, it is first necessary to destroy cognitive independence; independent thinkers will govern their own lives and will not live as suckled wards of the state. To build a citizenry obedient to the state requires a classroom that inculcates conformity to the group. 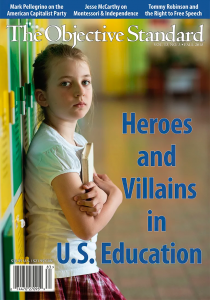 Intelligent Americans often note two seemingly distinct aspects of America’s schools: (1) The teaching of academic subjects is poorly done (if done at all), and (2) the educational system is a hotbed of anticapitalist propaganda. The fact is that the two observations are intimately related. The Progressives and their intellectual heirs severely dumbed down the schools as a necessary means of inculcating conformity, dependency, and obedience. Their vision is clear: They, the educated, intellectual elite—the educational and social engineers—will govern in the classroom and in the legislature. The people will conform and obey. Fortunately, this is not a vision shared by all educators. Shortly thereafter, several prominent American intellectuals rejected the antiacademic standpoint of the educational establishment and proposed a new, highly academic program for training the intellect. Among them were Robert Maynard Hutchins, the youthful president of the University of Chicago; and Mortimer J. Adler, a relentless autodidact and possibly the only person in history to receive a PhD (in psychology from Columbia University) without a high school or college diploma. Together, these two led a concerted campaign on behalf of a “Great Books” program. Hutchins and Adler maintained both that “a liberal education was unthinkable without a grounding in the Great Books”—the classic works of Western civilization—and that such academic training was the proper purpose of education. a single elementary and secondary school program for all students would ensure the upgrading of the curriculum and the quality of instruction to serve the needs of the brightest and to [educationally] lift the . . . least advantaged. He proposed that . . . vocational . . . training be given only after students had completed a full course of basic education in the humanities, arts, sciences, and language. Starting in the late 1920s and continuing through the 1930s, Hutchins and Adler taught a seminar titled “Great Books of the Western World” at the University of Chicago and elsewhere. The reading list included primary sources from scientists, mathematicians, philosophers, literary figures, and sundry diverse thinkers—such great minds as Plato, Euclid, Galileo, Shakespeare, Johann Wolfgang von Goethe, Albert Einstein, Sigmund Freud, and others. the object of general education should be “the training of the mind”. . . . The kind of educational program that was needed . . . would teach students to appreciate the importance of ideas, to understand history, the fine arts and literature, and to grasp the principles of science. Hutchins was a young, brilliant, eloquent spokesman for intellectual training, and his message received an enthusiastic reception from newspapers, magazines, and the general public. But not from the schools of education. William Heard Kilpatrick led the onslaught against the pro-academic educators. In their criticisms of the Great Books approach, Dewey and Kilpatrick ignored the fact that Hutchins and Adler encouraged students to read not just the works of a single philosophic figure or tradition, but all of the greatest works of the Western canon. Included were John Locke, Isaac Newton, Goethe, Voltaire, Kant, Charles Darwin, Einstein, Freud, and other revolutionary thinkers “of the last 300 years”—and of earlier figures, as well. Further, consider the twisted logic and bitter irony of Soviet apologists imputing support for totalitarianism to those seeking to nurture independent cognition. How did a philosopher such as Dewey come to deeply despise intellectual training rooted in the most important philosophic thought of history? Among the many reasons, Dewey and other Progressives conflated certainty and absolute knowledge with dogmatism and political authority. Did Progressives truly believe that those who were certain of facts—such as 3 x 3 = 9, George Washington was the first president of the United States, or A is A—would inevitably sic the Gestapo on intellectual opponents? More likely, they understood that independent thinkers—those not reliant on any group or authority for their grasp of reality—would never make for obedient subjects, nor would such thinkers accept the communist dictatorship for which Progressives pined. The intellectual battle lines between these two groups of educators were clearly drawn. One side, in regard to elementary school, wanted primarily to teach students practical life skills and conformity to the group, with a dollop of cognitive training mixed in. The other side wanted to provide students with practical life skills and foundational knowledge of academic subjects—and, above all, to teach them to think independently. These differences continued into secondary school. One side sought to socialize students, to provide vocational training for most of them and academic education only for an elite few. The other side strove to continue teaching academic subjects, to teach students to think for themselves, and, in many cases, to prepare them to study the timeless works of Western civilization—works that shed light on history, science, philosophy, and art, and that provide principles and guidance for the present and future. In short, the goal of the Progressives was to saturate students in the spirit of service and prepare them for community life. On the other hand, the goal of the heroic educators opposing them was to teach students to think, learn, and understand the world. In order to achieve their ends, Progressives needed to do more than merely attack the ideas of Montessori, Hutchins, and Adler. Their antiacademic campaign would culminate in an assault on the very root of cognitive development. What was the most effective way to bar millions of students from intellectual training? Cripple their ability to read. In 1955, when the campaign in favor of intellectual training seemed lost, Rudolf Flesch fired a shot heard ’round the nation with his brilliant book Why Johnny Can’t Read. Flesch was an Austrian Jew who fled the Nazis and emigrated to America. He held a doctorate in law from the University of Vienna and earned a PhD in library science from Columbia University. Knowing there was little illiteracy in Austria and in Western Europe more broadly, he was nonplussed by the rampant reading problems he encountered in America. [T]here are no remedial reading cases in Austrian schools. . . . There are no remedial reading cases in Germany, in France, in Italy, in Norway, in Spain—practically anywhere in the world except in the United States. . . . Did you know that there was no such thing as remedial reading in this country either until about thirty years ago? He discovered that from the start of the 20th century, American educators almost uniformly repudiated the tried-and-true phonics method of teaching reading. Phonics makes efficient use of one of the great intellectual achievements of human civilization: the development of the Roman alphabet. This alphabet is the basis of most European languages and is composed of twenty-six letters that give rise, in English, to forty-four sounds. By the time most children are five, they generally can speak thousands of words in their mother tongue. At this point (and probably earlier), it is possible to teach them the alphabet, the literary symbols that make up the verbal sounds. In a matter of months, children between the ages of five and six can master the written alphabet and begin to sound out words. For centuries, billions of children in dozens of nations around the world have mastered the all-important art of reading by this method. Even in English, a so-called irregular language, only approximately 13 percent of words are pronounced differently than they are spelled. This means that children trained in phonics can sound out about 87 percent of words in the language. Then, as proficient readers, they learn by experience to match irregular spellings—for example, “rough”—with the spoken word that they well know. should receive praise for a good guess even though it is not completely accurate. For example, if a child reads “I like to eat carrots” as “I like to eat cake,” praise should be given for supplying a word that makes sense and follows at least some of the phonic cues. Advocates of the whole word method hold that phonics overloads a child’s mind with too many letters and sounds that must be memorized. So, in place of this, they endorse a system that requires readers to memorize the shape of every word in the language. Memorize not twenty-six letters and forty-four sounds that enable readers to decode untold thousands of words in the English language—but memorize the shape of every word in the entire language. Phonics is a superb time and mental space saver: a simple method, once mastered, to decipher the vast preponderance of words. The whole word method, on the other hand, is akin to a gigantic warehouse containing millions and millions of items, randomly stored, with no letter-by-letter classification, requiring searchers to memorize the shape of each, later to recall that shape and its meaning as needed. It is no mystery that one method is vastly superior to the other. Early in this country’s history, phonics had been dominant. Noah Webster’s Blue-Backed Speller, first published in 1783—and later, McGuffey Readers—used phonics to teach reading and then introduced children to literature: real stories that captured the imagination. But by the 1920s, the professional curriculum designers had rejected phonics in favor of look-say. For example, Dr. Arthur Gates of Teachers College, Columbia University, published in 1928 New Methods in Primary Reading, an influential book supporting look-say. In an earlier essay, Gates had written, “That it will be the part of wisdom to curtail the phonetic instruction in the first grade very greatly, is strongly implied; indeed it is not improbable that it should be eliminated entirely.” His book argued along similar lines, diluting this guidance only slightly, omitting only the part about eliminating phonics entirely. Nonetheless, the educational establishment clung to the whole word method; and, by the 1980s, in a new form, it made a sweeping comeback. Its new iteration was known as “whole language.” Whole language retained the whole word approach and thus the obdurate refusal to teach phonics. Some advocates of this approach, to their credit, recognize that children introduced to great literary works are impelled by their natural curiosity to read interesting stories. However, whole language advocates continue crippling children’s minds with stultifying guessing games—rather than enlightening them with the proven method of phonics. When some schools course-corrected and reintroduced phonics, the results were telling. After students taught with whole language repeatedly tested poorly, their elementary school in Texas switched to intensive phonics training. On a subsequent statewide reading test, 98 percent of students from the school scored at or above grade level. The continued commitment to the whole word method on the part of education professionals would be unfathomable without a grasp of their basic motives. But once we apprehend that their aim is to create “well-socialized” future citizens obedient to commands for “the good of humanity,” the Progressive repudiation of phonics becomes readily understandable, even predictable. If you want children to read well, you embrace phonics. If you do not want children to read well—or at all—you reject it. If you want students to master academic subjects, you embrace phonics. If you do not want students to master academic subjects, you reject it. It’s no wonder that many American students cannot read. The “educational experts” who train their teachers do not want them to. This same horrific tale has been replicated across the entire academic curriculum. In keeping with the principles of the curriculum designers, less and less attention is given to academic subjects. Regarding math, for example, the middle schools are “heavily mired down in simple arithmetic.” By the late 1990s, only three states required more than two years of math to graduate from a public high school. “Most required two years, and others even less.” By then, more than a third of public high school graduates had never taken a full course in basic algebra; 45 percent had never taken intermediate algebra; and trigonometry had all but vanished—only one graduate in eight took an introductory course. The numbers haven’t changed much since then, and high school students still do not learn enough math to prepare them for college. Because academic subjects are sparsely taught, if taught at all, teachers need little mastery of them; instead, they take “education” courses. As Gross writes, “High school teachers in training typically take fewer credits in their majors than other students majoring in the same subject.” In other words, future math teachers take fewer math courses than do math majors, English teachers take fewer English courses than do English majors, and so on. One telling fact is that, whereas for decades CliffsNotes’ readership consisted largely of high school and college students, by the turn of the 21st century, their prime demographic had shifted to English teachers who had taken few literature courses, had never read the books they were now teaching, and were ill-equipped to interpret them. The Progressives are winning their war against the academic program and intellectual training. After sober and judicious consideration, and weighing one thing against another in the interest of reasonable compromise, H. L. Mencken concluded that a startling and dramatic improvement in American education required only that we hang all the professors and burn down the schools. His uncharacteristically moderate proposal was not adopted. Those who actually knew more about education than Mencken did could see that his plan was nothing more than cosmetic and would in fact provide only an outward appearance of improvement. Those who knew less, on the other hand, had somewhat more elaborate plans of their own, and they just happened to be in charge of the schools. The curriculum designers will die before relinquishing their power to cripple students’ minds. The educational establishment is a monolith that cannot easily be defeated. But it can be circumvented. Further, homeschooling is once again legal in every state. In 2003, approximately 1,096,000 American students were being homeschooled; by 2012, the number had swelled to 1,773,000, approximately 3.4 percent of the country’s students age five to seventeen. As the nation’s public schools continue to decline, the number of homeschoolers will no doubt increase. Another thing we can do is advocate and support homeschooling initiatives. As for reading, many parents now realize that phonics opens up the rich world of books to their children, and companies such as Hooked on Phonics offer products that make it easier than ever for parents to teach their children at home. Another powerful and largely untapped resource that parents can use are the many full-time graduate students working toward advanced degrees, not in “education,” but in math, science, literature, history, and every other academic subject. Generally, these graduate students know their field better than many (if not most) teachers. Many do not yet have full-time jobs, so they tend to need money. Parents can use social media and other online sources to find such graduate students in their area and, at reasonable hourly rates, hire them as tutors for their children. Even if a graduate student is not local, he can conference with students anywhere in the world using Skype, Google Hangouts, FaceTime, and similar free tools. At the college level, the influence of Hutchins and Adler has been revived at a few schools. For example, the Great Books program at St. John’s College provides superb training in the classics of Western civilization at both its Annapolis and Santa Fe campuses. So do the programs at Thomas Aquinas College in Santa Paula, California, University of Chicago, and several other colleges and universities. There is even a Great Books program dedicated to promoting the foundations of freedom and capitalism—the Lyceum program at the Clemson Institute for the Study of Capitalism. Although opportunities for and outposts of intellectual training still exist, the dominance of the same failed educational theories remains a travesty. To fight it, we must speak out at whatever level is open to us, public or private, among friends or among strangers, in person or online, via Twitter or letters to congressmen. We must champion the mind, intellectual training, and a rigorous academic curriculum. For the sake of justice on behalf of the countless minds already stunted, and to protect countless more, we must tell the bitter truth about the American educational establishment. If we can save even one priceless mind, it will be worth it. With a concerted effort, we can save many. Emily Richmond, “How Do American Students Compare to Their International Peers?,” The Atlantic, www.theatlantic.com/education/archive/2016/12/how-do-american-students-compare-to-their-international-peers?/ (accessed June 2, 2018). Julia Ryan, “American Students vs. the World: Expensive, Unequal, and Bad at Math,” The Atlantic, www.theatlantic.com/education/archive/2013/12/american-schools-vs-the-world-expensive-unequal-bad-at-math/ (accessed June 2, 2018). National Adult Literacy Survey (1992) NCED, United States Department of Education. Cited at www.readfaster.com/education_state (accessed July 9, 2018). John Hood, “The Failure of American Public Education,” Foundation for Economic Education, February 1, 1993, www.fee.org/articles/the-failure-of-american-public-education/. “A Nation at Risk,” www2.ed.gov/pubs/NatAtRisk/risk.html (accessed July 8, 2018). Charles Sykes, Dumbing Down Our Kids: Why American Children Feel Good About Themselves but Can’t Read, Write, or Add (New York: St. Martin’s Griffin, 1995), 100–101. See, for example, Andrew Bernstein, The Capitalist Manifesto: The Historic, Economic, and Philosophic Case for Laissez-Faire (Lanham, MD: University Press of America, 2005). See especially chapter five, “The Inventive Period,” 137–61. Much of this material was included in my earlier article, “The Educational Bonanza in Privatizing Government Schools,” The Objective Standard 5, no. 4 (Winter 2010–2011): 21–32. I repeat it here because it sets the context necessary for this article. Hans Sennholz, ed., Public Education and Indoctrination (Irvington-on-Hudson, NY: Foundation for Economic Education, 1993), 38. Sennholz, Public Education, 22–23, 26, 38–39, 44. Benjamin Franklin, Writings (New York: Library Company of America, 1987), 1372. Sheldon Richman, Separating School and State (Fairfax, VA: Future of Freedom Foundation, 1993), 38. Richman, Separating School and State, 38. Thomas Sowell, Inside American Education: The Decline, The Deception, The Dogmas (New York: Free Press, 1993), 7. Pierre Du Pont Nemours, National Education in the United States of America, translated from the second French edition of 1812 and with an introduction by B. G. Du Pont (Newark: University of Delaware Press, 1923), 3–4, quoted in Sennholz, Public Education, 23–24. Quoted in Lawrence Cremin, The Transformation of the School: Progressivism in American Education, 1876–1957 (New York: Vintage Books, 1964), 62. Cremin, Transformation of the School, 62. Sykes, Dumbing Down Our Kids, 203. Diane Ravitch, Left Back: A Century of Failed School Reforms (New York: Simon & Schuster, 2000), 134. Ravitch, Left Back, 137; Thomas Snyder, ed., “120 Years of American Education: A Statistical Portrait,” nces.ed.gov/pubs93/93442.pdf (accessed July 8, 2018); the nation’s entire population in 1920 was roughly 106 million. The proportion of five- to seventeen-year-olds in the country was 28 percent in 1900 and gradually declined to 20 percent in 1947. School enrollment rates for this age group were 51 percent in 1900 and rose steadily to 75 percent in 1940. If roughly four million students were IQ tested each year during the 1920s, simple arithmetic tells us that this represents a huge proportion of the student population. John Franklin Bobbitt, The Curriculum (Boston: Houghton Mifflin, 1918), 3–5, quoted in Ravitch, Left Back, 165. W. W. Charters, Curriculum Construction (New York: Macmillan, 1923), 4, 13–14, quoted in Ravitch, Left Back, 166. Charters, Curriculum Construction, 44–46, quoted in Ravitch, Left Back, 167. Sykes, Dumbing Down Our Kids, 205. Richard Mitchell, The Graves of Academe (Boston: Little, Brown, 1981), 75. Sykes, Dumbing Down Our Kids, 206, quotes from National Education Association, Cardinal Principles of Secondary Education: A Report of the Commission on the Reorganization of Secondary Education, Bulletin No. 35 (Washington, DC: Bureau of Education, 1918). Sykes, Dumbing Down Our Kids, 206–7, quotes from Cardinal Principles. Quoted in Sykes, Dumbing Down Our Kids, 205. George Santayana, The Life of Reason: Reason in Common Sense (New York: Scribners, 1905), 284, quoted in the Internet Encyclopedia of Philosophy, www.iep.utm.edu/santayan/ (accessed July 8, 2018). “Social Studies in Secondary Schools: Preliminary Recommendation by the Committee of the National Education Association,” History Teacher’s Magazine (December 1913): 291–92, quoted in Ravitch, Left Back, 128. John Dewey, The School and Society (Chicago: University of Chicago Press, 1990), 15. Michael Knoll, “Laboratory School, University of Chicago,” in Encyclopedia of Educational Theory and Philosophy, edited by D. C. Phillips (Thousand Oaks, CA: Sage, 2014), 455–58, available online at mi-knoll.de/122501.html (accessed June 11, 2018). .Katherine Camp Mayhew and Anna Camp Edwards, The Laboratory School of the University of Chicago, 1896-1903 (New York: Appleton-Century, 1936), 96–113, 118, 127–37, 156–81, 185–99, 206–18, 240–41, quoted in Ravitch, Left Back, 171. John Dewey, The School and Society (Carbondale: Southern Illinois University Press, 1980), 11, 20. John Dewey, Experience and Education (New York: Collier Books, 1938), 17. “My Pedagogic Creed,” School Journal 54 (January 1897): 77–80, http://dewey.pragmatism.org/creed.htm. Dewey, School and Society, 11, 20. Cremin, Transformation of the School, 220. E. D. Hirsch, The Schools We Need and Why We Don’t Have Them (New York: Anchor Books, 1996), 52. Ravitch, Left Back, 179; interior quotes from William H. Kilpatrick, “The Project Method,” Teachers College Record (September 1918): 323, 329–30. Samuel Tenenbaum, William Heard Kilpatrick: Trailblazer in Education (New York: Harper, 1951), 264–66, quoted in Ravitch, Left Back, 209. Quoted in Ravitch, Left Back, 205–6. Maria Montessori, The Montessori Method (Middletown, DE: Create Space Independent Publishing Platform, 2014 (1912), 3–11 and passim. Ravitch, Left Back, 300, 301. William Heard Kilpatrick, The Montessori System Examined (Boston: Houghton Mifflin, 1914), 54–55. Kilpatrick, Montessori System Examined, 59–60. Ravitch, Left Back, 298, 303. Eunice Fuller Barnard, “A Teacher’s Teacher Tells What Education Is,” New York Times, March 21, 1937, 5, quoted in Ravitch, Left Back, 304. Dewey quoted in Ravitch, Left Back, 304. Rudolf Flesch, Why Johnny Can’t Read (New York: Harper & Row, 1955), 10. Flesch, Why Johnny Can’t Read, 26–34 and passim. Quoted in Flesch, Why Johnny Can’t Read, 12–13. Dixie Lee Spiegel, Reading Teacher, April 1978, quoted in Flesch, Why Johnny Still Can’t Read (New York: Harper Colophon, 1983), 24. Martin Gross, The Conspiracy of Ignorance (New York: HarperCollins, 1999), 78. Leonard Peikoff, “The American School: Why Johnny Can’t Think,” in Ayn Rand, The Voice of Reason: Essays in Objectivist Thought (New York: Penguin Books, 1989), 217. Quoted in Flesch, Why Johnny Can’t Read, 54. Flesch, Why Johnny Can’t Read, 58–65. Jeanne Chall, Learning to Read: The Great Debate (New York: McGraw-Hill, 1967), 3, 7. Quoted in Ravitch, Left Back, 356. Gross, Conspiracy of Ignorance, 81. Gross, Conspiracy of Ignorance, 106. Gross, Conspiracy of Ignorance, 107. Kati Haycock, “47% of High School Grads Aren’t Prepared for College,” April 13, 2016, www.marketwatch.com/story/how-high-schools-are-failing-those-who-earn-a-diploma-2016-04-13 (accessed July 30, 2018). Gross, Conspiracy of Ignorance, 115–16. Italics added. Annie Holmquist, “High School Reading Lists: 1922 vs. Today,” www.theimaginativeconservative.org/2018/05/high-school-reading-lists1922-today-annie-holmquist.html (accessed July 18, 2018). Quoted in Gross, Conspiracy of Ignorance, 187–88. Gross, Conspiracy of Ignorance, 46 (italics in the original). Private correspondence from CliffsNotes’ general editor to the author upon the occasion of hiring him to write the notes for three Ayn Rand titles. Mitchell, Graves of Academe, 69. Arthur Bestor, Educational Wastelands: The Retreat from Learning in Our Public Schools (Urbana: University of Illinois Press, 1953), 101. Hirsch, Schools We Need, 54. Gross, Conspiracy of Ignorance, 115. The company offers various apps, games, workbooks, and so forth that help children master the alphabet and sound out words. See hookedonphonics.com.